Guitar lessons in Victoria, BC, Canada with Bradford Werner. All ages and levels are welcome. I teach at the Victoria Conservatory of Music and a private studio offering one-on-one lessons, ensemble coaching, and masterclasses. Lessons are positive, productive, and well-rounded. I specialize in classical guitar but believe students should be able to cross genres and styles if needed. All my students learn to read music notation, play with a refined musicality, learn an appreciation of music history, and use proper technique. However, even the best classical guitarist should be able to strum songs and improvise at a basic level so part of the lessons are dedicated to becoming a well rounded modern guitarist. I enjoy teaching a variety of students from youth, post-secondary, to hobbyist adults. I’ve been teaching at the Conservatory for over 14 years and have been playing guitar for over 28 years. I’ve adjudicated festivals, exams, and masterclasses for a variety of organizations including The Alberta Provincials, Mount Royal University, Calgary Guitar Society, Camosun College, and many more. Outside of teaching I also perform and have recorded with financial assistance from the Canada Council for Arts. Learn more at my About Page. 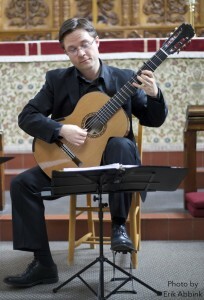 I primarily teach and perform on classical guitar. The classical guitar is a nylon string instrument played with the fingers and has a musical history ranging from the Renaissance era to modern times, Latin and Spanish music, and many cross-over styles. Students of the classical guitar learn all the same things that pianists, violinists, and other orchestral musicians learn. It is likely the most versatile musical instrument in terms of styles and eras of music. My classical students also learn some popular music, chords, and improvisation as well. In the end, classical students learn everything. I don’t require my students to focus on “classical” music necessarily, once they have the skills of a good musician they can choose what styles or genres they wish to pursue. The educational benefits of the classical guitar teaching route create solid musicians that can read music, perform, and tackle a variety of musical styles and situations. I teach a limited number of students who wish to learn popular styles (rock, folk, jazz, metal), chords, melodies, and fingerstyle guitar arrangements. As long as the student is interested in learning about how music works, basic reading skills, and is willing to play some set educational material then I enjoy teaching them. I also encourage my popular style students to learn solo arrangements so they can perform solo if they choose. So many guitarists are left out if they don’t play in a band or sing so learning some solo arrangements ensures they have something to play that sounds complete. I teach using progressive methods that ensure the student successfully completes one goal before moving to the next. This creates happy and productive students. I’ve created my own books and materials to ensure that both the student and teacher can clearly track progress and achievement in an enjoyable and educational environment. This is common practice in piano and string lessons but more rare in guitar pedagogy. It’s important that both the student and teacher can see completed goals and track progress because that is what makes lessons exciting and successful. Another major element in my teaching is to ensure the student develops positive and successful practice habits. Students need to practice well but they also need to enjoy practicing so the experience is rewarding, enjoyable, and encouraging. These are life lessons that can help students in many other areas of their life from study habits, schoolwork, and employment. I’m also particularly proud of how all my youth students present themselves in respectful, positive, and confident ways during lessons and public performances. I regularly act as an examiner for the Conservatory as well as adjudicate festivals such as the Alberta Provincial Festival, Mount Royal University Conservatory, Medicine Hat Festival, Northwest Music Festival, and many festivals in Western Canada over the past 10 years. Also, many of my students take both VCM and RCM exams between the levels of Grade 1 to ARCT. My students have, on numerous occasions, come in 1st place at the Victoria as well as the BC Provincial Festival competitions. Also see my guitar blog (thisisclassicalguitar.com) for online lessons or quotations from students and parents.